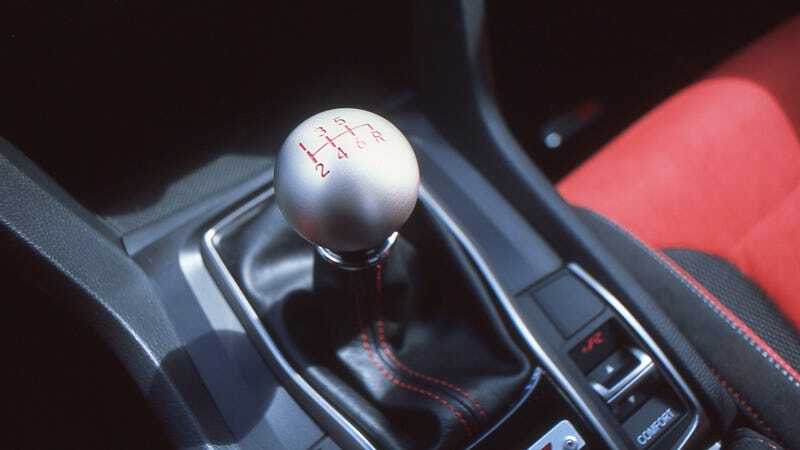 This generation has been losing out a lot on manual transmissions. Fewer and fewer cars come with them. Fewer and fewer drivers know how to use them. But there’s another joy that’s fading away: the satisfaction of seeing a car parked across the street, walking over, looking in the window and discovering that the car is not an automatic (lame) but a manual (hell yes). I agree that not having manual transmissions available on new cars is a bummer for us as drivers. What a strange moment it was when you could get a Corolla with a third pedal but not a Porsche 911 GT3 a few years back. Again, this is a bummer for anyone in the market for a new or not-that-old car. But the pleasure of discovery is not to be missed. Nah. Automatic. Dreams crushed. It’s a loafy car, living a life devoid of clutch kick u-turns and whatever other three-pedal mania you might desire. A whole generation is being raised that’s not thinking about this distinction. Without even the possibility that, say, that Infiniti could even possibly come with a manual, there’s no hunt for the “good” ones with stick shifts. This isn’t the greatest woe facing car culture, but it’s distinct, and I feel ever stranger every time I cross the street to see if, oh man, that Aston Martin Vantage, that Subaru Legacy, could it be?